The Moon is full in Virgo on March 1st. Satsang has been very juicy lately as we explore the five root afflictions–the klesha. It seems like a good time to gather for a special evening satsang, to chant and dive in a little deeper on our painful patterns of mind. Please join us at the Chrysalis studio at 7:30 p.m. on March 1st. Gather under the Full Moon for an hour of Chanting, Pranayama and Meditation, as we open to the promise of a New Year. The Full Moon, always a powerful time for tuning in to our deeper waters, rising on New Year’s Day calls us to slow down, reflect, and move forward with clear intention. During the Full Moon, the tides are high, the veils are thinned and our consciousness is heightened. We come together in the light of the Moon, creating a circle of intention, to breathe, reflect, and chant ancient mantras of light, transformation, healing, and peace. Sherry Cassedy will lead the evening as we join our voices, our breath, and our intentions. Follow this link to view Sherry with Sutra Sister Jhoane chanting the Sadhana Pada of Patanjali’s Yoga Sutra. 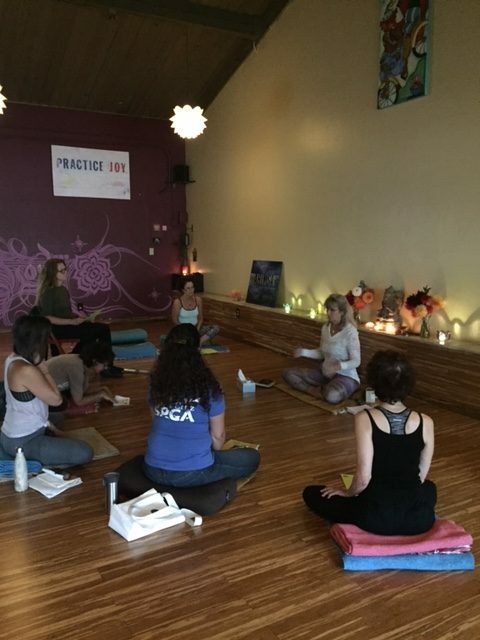 Pleasure Point Yoga’s Monday morning Satsang is a unique (and free) opportunity to delve deeper into the esoteric teachings of Yoga in the company of one another. It is a great introduction for anyone who is curious to learn more, and an open invitation to revisit and share in the supported space of the Sangha as we deepen our practice. We are currently finishing a review of Book One (through I.34) to integrate and will be diving back into Book Two in early November. it is a great time for newcomers. Sherry Cassedy will be leading through November 20, and then Aerielle Webber will lead through December 18. Join us. Halloween fun includes playing with masks and costumes to change or disguise ourselves. In this pre-Hallow’s Eve Satsang, we will explore the everyday masks we wear that hide our true identity, even from ourselves. What are the masks we wear and why? Who are we really? How do we know the truth of who we are? 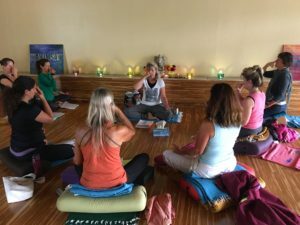 Sherry Cassedy will draw on Yogic wisdom to explore these questions engaging students with self-exploration and discussion, closing with pranayama and meditation. 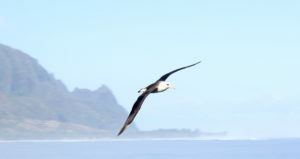 We hope this evening Satsang will allow students who are unable to join Sherry’s regular Monday morning Satsang at PPY, an opportunity to come together in community to explore the natural connections between our experience, the world around us and the worlds within. Come dive in! Free and open to all; No prior study required. Two Wings of Yoga Sutra Session at I AM Yoga rescheduled for September 19. 6:45 -8:45 a.m. at I AM Yoga. Join us for sunrise session and discussion of Patanjali’s two-pronged method for calming the mind. Sharing the Path of Yoga, Yoga Flow and Dharma Talk on Head and Heart-led Practice with Aimee Joy at Pleasure Point Yoga. Saturday, September 9, 2:00 – 4:30 p.m. at Pleasure Point Yoga. Join us for a gentle flow, juicy discussion and yin closing. More information and registration at pleasurepointyoga.com. 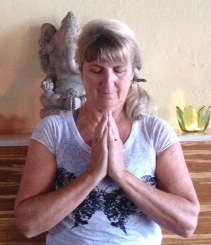 Sherry will also be teaching the Tuesday evening 7:15 p.m. Yin class at Pleasure Point Yoga for the next three weeks, starting tonight! 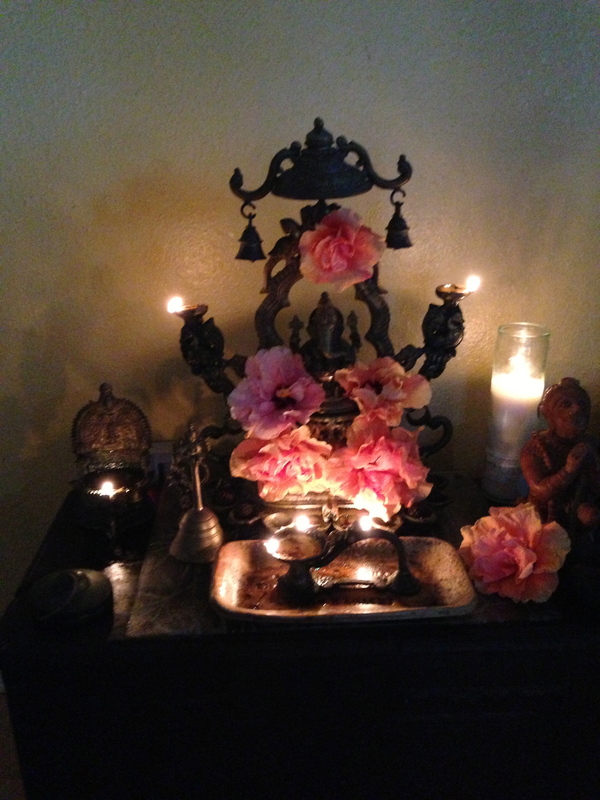 And of course the regular Monday morning Satsang at Pleasure Point Yoga, 7:30 – 8:30 a.m. every week. On August 21, the day of total solar eclipse, Sherry will offer a special satsang to explore and connect with the power of the eclipse and the deeper opening it invites. Come chant and breathe and share in the radiance. I AM YOGA, El Granada. Join us in the wake of the New Moon and Solar Eclipse (August 21) to delve further into the ancient and yet practical wisdom of Patanjali’s Yoga Sutra. 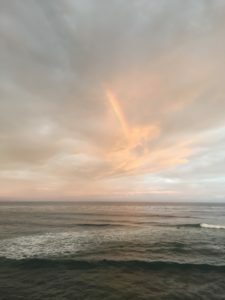 Building on Bhavani Maki’s teaching of Patanjali’s definition of Yoga, we will explore Patanjali’s lesson on the tried and true method for calming the stormy nature of the mind. Equipoise in asana practice is supported by balancing two essential components—practice and dispassion. The sutra guide the physical practice but also the practice of yoga in our lived experience. Sherry Cassedy (thresholdguidance.com) has studied with Bhavani for 14 years and edited her first book, The Yogi’s Roadmap. Sherry will build on the Sutra foundation that Bhavani has laid in her workshops, integrating the deeper teachings of Patanjali’s Yoga Sutras with our physical asana practice, bringing the teachings home to our embodied experience. “We’re about to enter the twilight zone – a lunar month that begins with a Leo New Moon, which grows into a partial Lunar Eclipse in Aquarius/Leo and ends with another Leo New Moon that is also a powerful Solar Eclipse. “This is the month when we reclaim our heart’s power to transform our life with love. “This is a month to open to the power of creation and let it rip through our psyches until we are breathless with the fun and wonder of the Light. This is the month to step into our heart’s power. In honor of the powerful New Moon July 23 , Full Moon on August 7 with partial Lunar Eclipse, and New Moon with Full Solar Eclipse on August 21 I will be chanting on the three MoonDay nights, July 24, August 7, and August 21, from 7:30 to 8:30 p.m. at the Chrysalis studio, 111 Moran Way. The power of our intention when we chant mantra on the Full and New Moon and especially on the Eclipse is multiplied many fold. Join me for the simple practice of chanting. From the ancient Gayatri, combined with the Tryambaka for transition from life to death, to the Peace pact, the Mangala mantra for Well Being of all, and the complex Hanuman Chalisa, we will raise our voices and breath, and send our powerful intention out into the universe. Donation only. Bring a friend. Let me know if you will be here so I can plan accordingly. It is a powerful time to support one another in our becoming and to sing our hearts out. When we chant.sing, we pray twice. Unknown. Dream Workshop July 10 7:00 p.m.
Join us to delve into the unconscious realm of our dreams. Monday evening, July 10. 7:00 p.m. at the Chrysalis Studio.